J. Wellington Wimpy, known mostly as Wimpy in the Popeye comic strip, lived up to his name. Wimpy is the adverb form of wimp, someone who's weak and wishy-washy. Although Wimpy was skillful in getting others to fight, particularly Popeye and Bluto, he would avoid such dangers himself. His catch phrase was, "I'd gladly pay you Tuesday for a hamburger today," and this saying is often used to express fiscal irresponsibility. There are some supposed elementary particles that are a lot like Wimpy. They're fat (massive) and lazy (weakly interacting). A WIMP is a "weakly interacting massive particle." Although I wrote "supposed elementary particles," there's a lot of evidence from observational astronomy that these should exist. Astronomers have been puzzled for quite some time that galactic clusters are more tightly bound than the stellar mass of their galaxies should allow. They think that galaxies have mass that they aren't able to see, and they've conjectured that this dark matter makes up about 80% of the mass of the universe. This matter is dark because it does not interact electromagnetically. Whatever this dark matter might be, it must composed of massive particles that do not interact except by gravitation. This "missing mass" is a long standing problem, and many years ago, I wrote a limerick about it. The accountant was ranting and hissing! Such an audit was not of our wishing! Since some of our mass was found missing! How to you detect something that doesn't interact as matter normally does? WIMPS are expected to scatter off atomic nuclei, but detection rates are predicted to be small. To enhance your chances, you would want your detector to contain a lot of atoms with very large nuclei. One detector, XENON 100, is based on 62 kg of liquid xenon, an element with an atomic number of 54 and many stable isotopes with nuclei that contain 70 or more neutrons. [2-4] Of course, it's important to protect against background sources, such as cosmic rays and local radioactive sources. WIMP interaction with normal matter is hard to estimate, but it's likely anywhere from a single event per kilogram per year to a single event per ton per year. One of the biggest problems that the XENON team faced was the purification of the xenon gas. Commercial-grade xenon gas prepared by the usual distillation methods contains another noble gas, krypton, in a relatively high proportion (ppm level). The isotope 85Kr has a half life of just 10.76 years, so it acts as a potent background radiation source. The XENON team needed to distill their xenon from the ppb level available from the best commercial source until it was nearly a thousand times more pure. The XENON detection scheme uses two arrays of photomultiplier tubes (178 total PMTs) to detect scintillation of the xenon atoms. The PMT arrays allow position-sensitive detection in their apparatus which is important for separating signals from noise. The detector is able to discriminate WIMPS from neutrons and gamma rays. One of the photomultiplier tube arrays is shown in the photograph. Like parents eager to show photos of their newborn, the XENON team has published an analysis of the first 11.17 days of data that were taken in October and November 2009. The paper is presented as proof that their apparatus is indeed capable of detecting WIMPs since they are able to exclude extraneous events. The team observed no WIMP events, and they have excluded at a 90% confidence level any WIMP-xenon elastic scattering cross-section above 3.4 x 10-44 cm2 for a putative WIMP mass of 55 GeV/c2. Their published data, as shown in the figure, illustrates the high degree of selectivity their apparatus has in detection of WIMPs vs extraneous signals. No WIMPs today. Data from the XENON 100 experiment. In this representation of the photomultiplier data, valid WIMPS would appear as red circles in the dotted area. (Fig. 4 from arXiv, Ref. 4). This experiment is funded by multiple sources, including the National Science Foundation. The XENON 100 detector is now taking data at the Gran Sasso Underground Laboratory (Laboratori Nazionali del Gran Sasso) in Italy. Editors' Choice: All Quiet on the Dark Front, Science, vol. 330, no. 6004 (October 29, 2010), p. 563. The XENON100 Collaboration, E. Aprile, et al. 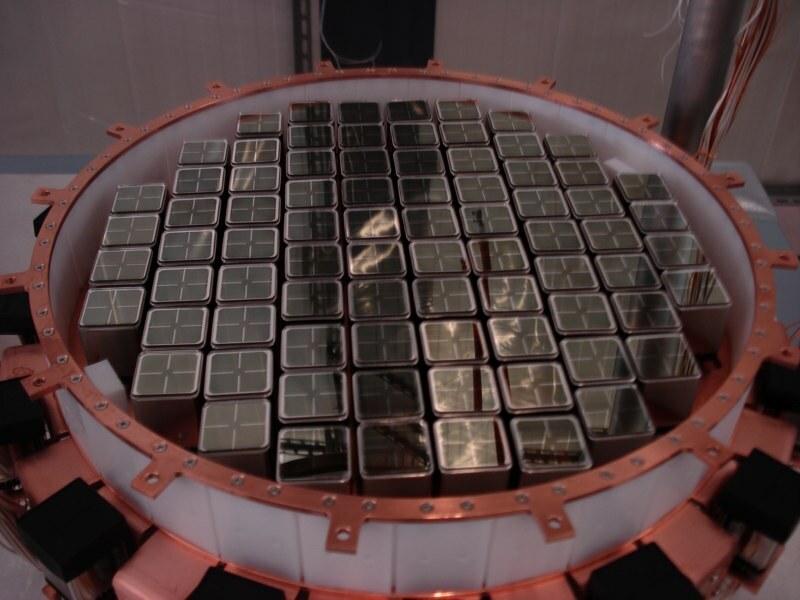 "First Dark Matter Results from the XENON100 Experiment," Phys. Rev. Lett., vol. 105, no. 13 (2010), document 131302 (5 pages). The XENON100 Collaboration, E. Aprile, et al. "First Dark Matter Results from the XENON100 Experiment," arXiv Preprint, May 11, 2010. Linked Keywords: J. Wellington Wimpy; Popeye; Wimpy; wimp; Bluto; weakly-interacting massive particle; WIMP; dark matter; XENON 100; xenon; isotopes; neutrons; distillation; noble gas; krypton; photomultiplier tube; scintillation; gamma ray; National Science Foundation; Gran Sasso Underground Laboratory; Italy.